Garry Rogers lives on a 20-acre farm on the Agua Fria River in Dewey-Humboldt, Arizona. Back in 1977 he began making lists of the birds he saw there. Over time he eventually catalogued 137 species (from1977-2016). 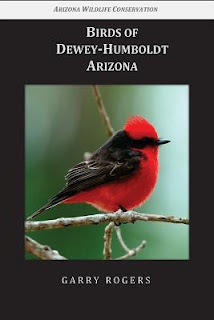 Rogers eventually compiled this comprehensive list into what is now the book Birds of Dewey-Humboldt, Arizona. He has included common and scientific names, estimates of species health and stability along with wonderful photographs, all with excellent detail and clarity. An index, with sightings is included in the back. This book is intended to be used as a field guide to help with identification and for note-taking. Birds of Dewey-Humboldt, Arizona is recommended for birdwatchers, conservationists and other enthusiasts. My observation were made 1997 to 2016. In 2017 we've added two more species and have confirmed the presence of two endangered species, the Southwestern Willow Flycatcher (nesting) and the Yellow-billed Cuckoo (probably nesting).